Friends for Our Riverfront: Q: Should the City spend $11.5M to build a 3rd riverfront restaurant? Q: Should the City spend $11.5M to build a 3rd riverfront restaurant? A restaurant on the riverfront – sounds like a great idea. 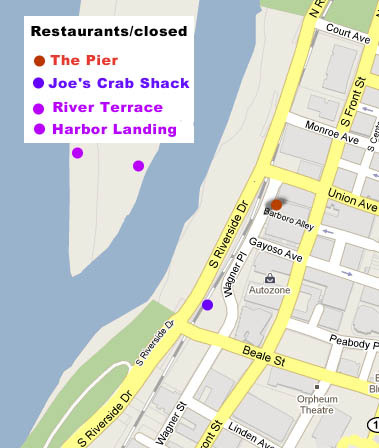 1) Joe’s Crab Shack is closed and being demolished. 2) The Pier closed a couple of months ago. 3) The 2 city-owned restaurants on Mud Island that the RDC runs, River Terrace and Harbor Landing, are closed except for private rentals. The estimated construction cost is $12.5M for the 60-seat restaurant, small ticket/gift shop section, and parking lot that will take up the northern 20% of what is now Tom Lee Park. No plans for operation and maintenance have been presented. The RDC will ask the City Council for the construction money Tues. (5/25). What about a less expensive and easier to maintain option? A suggestion for street food on the riverfront. Click HERE.